We awoke this morning to the sound of chainsaws: the huge poplar pollard between the end of our garden and the playground of Streatham & Clapham Girls' School is being felled, piece by piece. And in bird nesting season! Goodness knows how old it is. 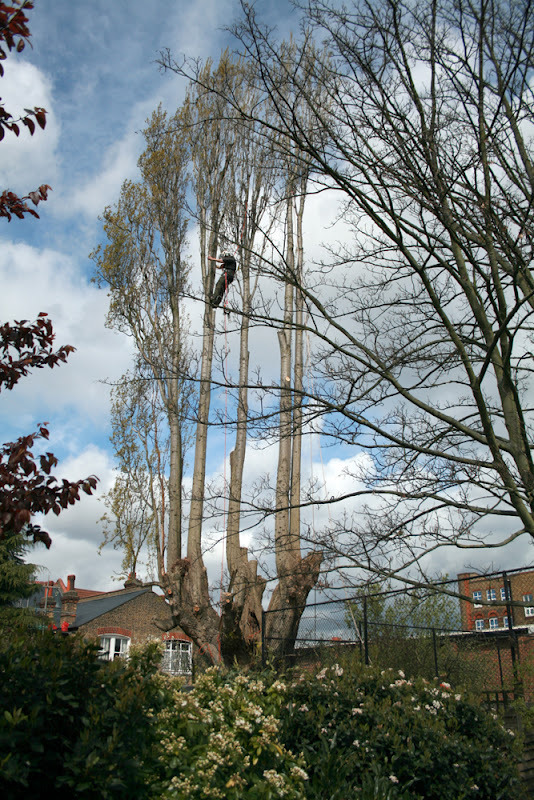 Left to their own devices, poplars live for about 150 years, but pollards can live a lot longer than other trees, possibly eternally – and the bole, the best way to judge these things, is vast. It's been home to dozens of squirrels who have (or had) several dreys in the crux and a couple up high, too; I wonder where they'll go now. The dog certainly won't miss them in our garden. But the fact is, trees get old and unstable; they begin to die naturally, and one such as this can't be allowed to fall. Weeping over every felled tree is foolish. After Hopkin's poplars were felled, another avenue was immediately planted. Those were again felled, in 2002, after storm damage made them unstable. But once again, a new avenue of poplars is growing up to fill the gap. Yet I wonder if anything will be planted in place of my poplar; anything that the squirrels can colonise, the woodpecker call home or the goldfinches swarm into and sing from? Sadly, I suspect not.